At tonight’s Schenectady City Council meeting, Nov. 13, I hope (despite the unrealistic 3-minute rule) to present and explain the issues depicted in collages posted below. 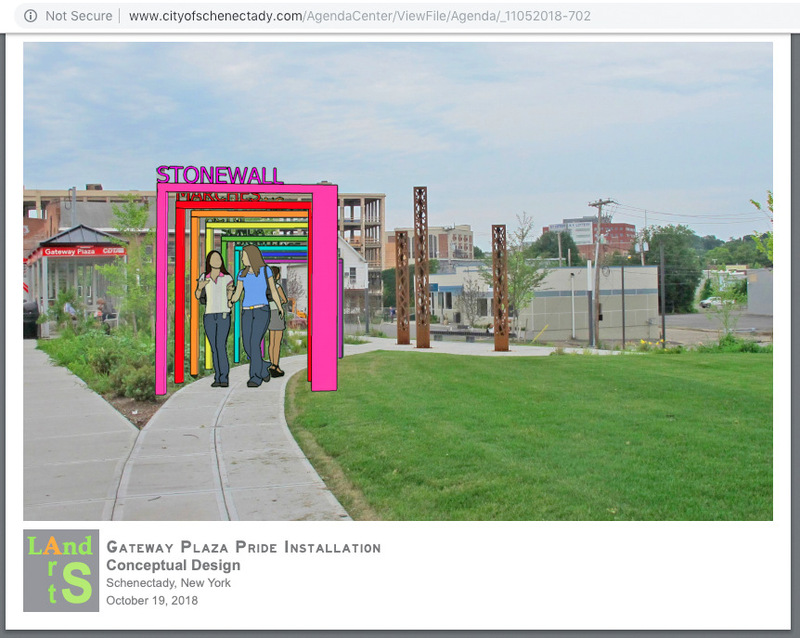 The first topic is related to the Agenda Item regarding approval of a Schenectady PRIDE art installation at Gateway/Liberty Park. 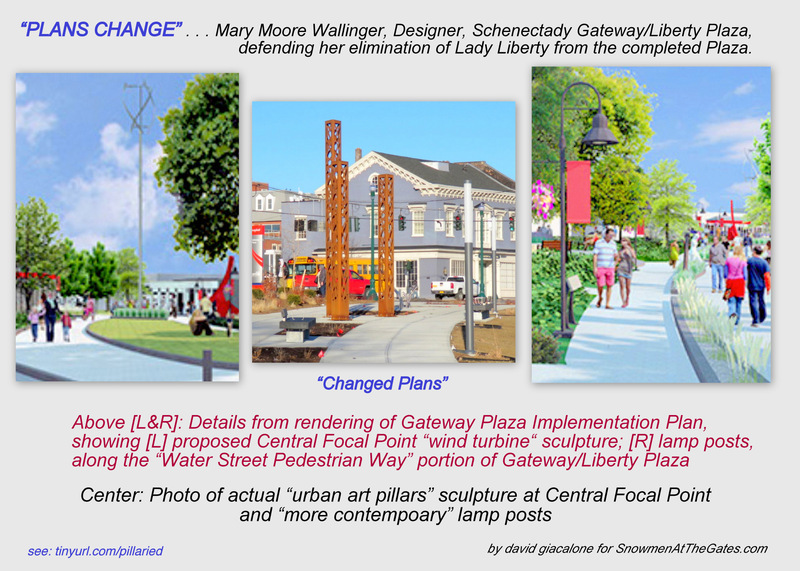 Schenectady needs an established procedure to ensure adequate public input and post-approval monitoring of plans for proposals regarding important public spaces and art. 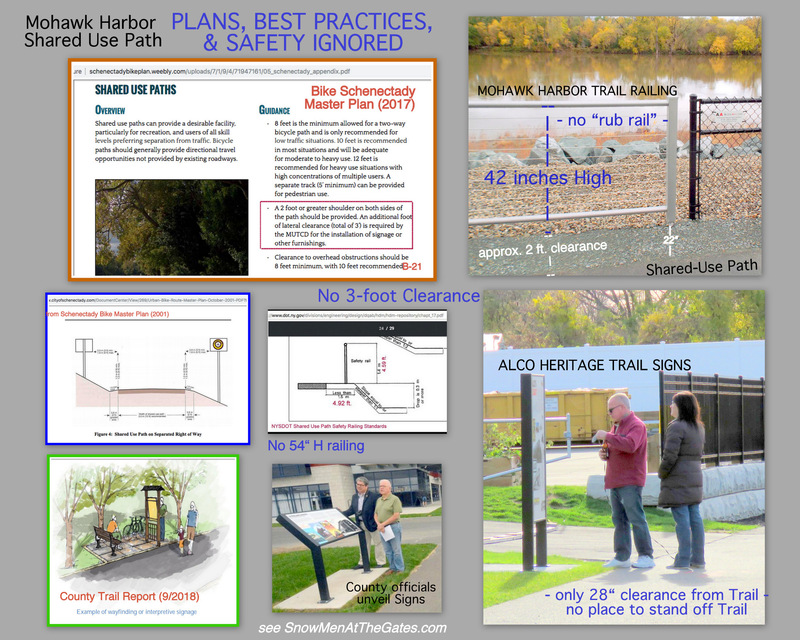 The second will be a Privilege of the Floor statement regarding important safety issues created along the Mohawk Harbor’s shared use path by the failure to follow rules, plans, and best practices when installing a guardrail on the riverside and a set of interpretive signs on the Casino side. 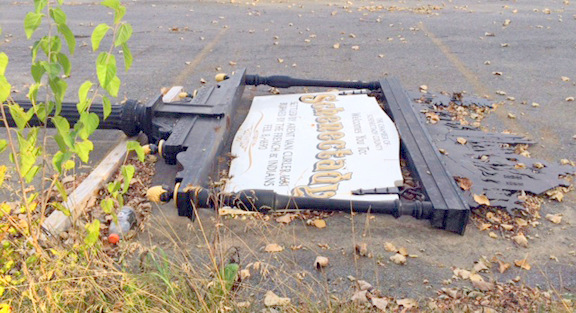 follow-up (November 24, 2018): The Daily Gazette reports “Stockade Association board asks for more public input on projects: The board detailed this in a letter given to the mayor and city council members” (by Andrew Beam, Nov. 23, 2018). Commentary can be found at the end of this posting. The Stockade Board has raised an important topic that will benefit residents throughout the City. 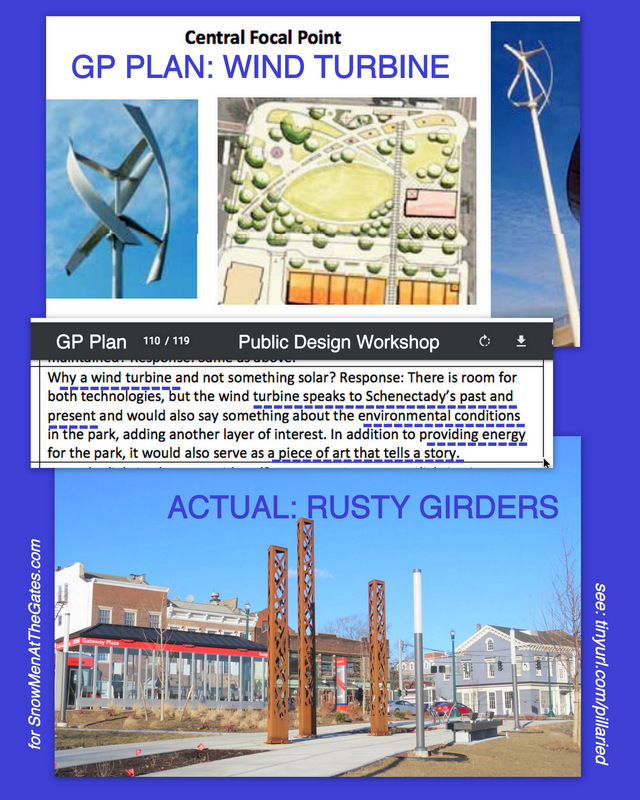 Public input must be increased in planning for important elements of major public spaces; given more weight; AND honored by fulfilling plans that have public support and City Council approval. The City has had five years to figure out how to restore the markers and monuments “in a cost-effective manner”, and surely could have done so, and used Gateway Plaza grants to do so, if the goal were taken seriously. 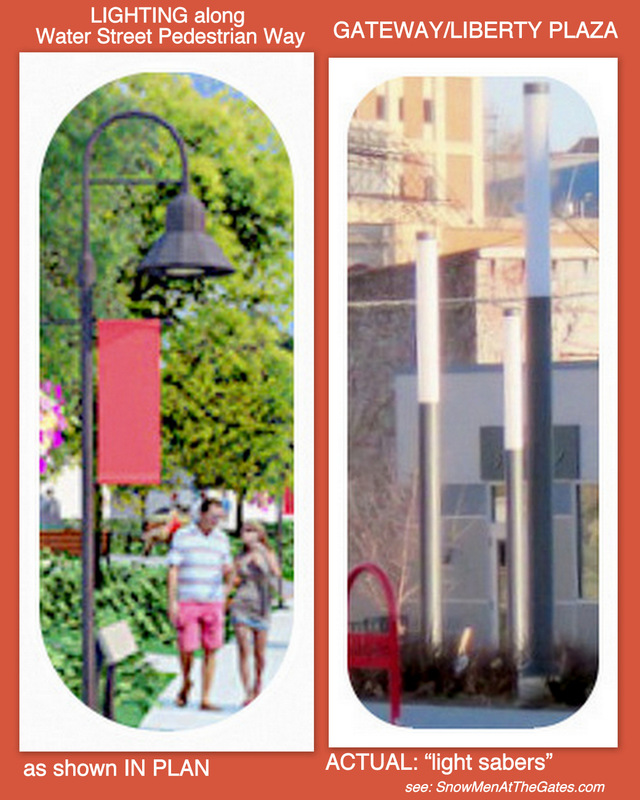 By the way: The photo at the right was taken in October 2017, and shows the popular wrought iron Chamber of Commerce Welcome sign that once stood at Liberty Park, “stored” on the ground, outside of a City warehouse. Despite his assertion, the Mayor should not and does not have broad “discretion” to change important elements of Plans supported by the public and approved by City Council (and signed by the Mayor). Only true emergencies, such as safety hazards or a financial crisis, should be the basis for changing important elements — not the whim of one person; and not without as much additional public input as possible. As for the Pride proposal for Liberty Plaza, rushing it through with no chance for meaningful public input on its basic design, size, materials, or location within the Plaza, undermines the public consensus for celebrating the important civil rights victories. 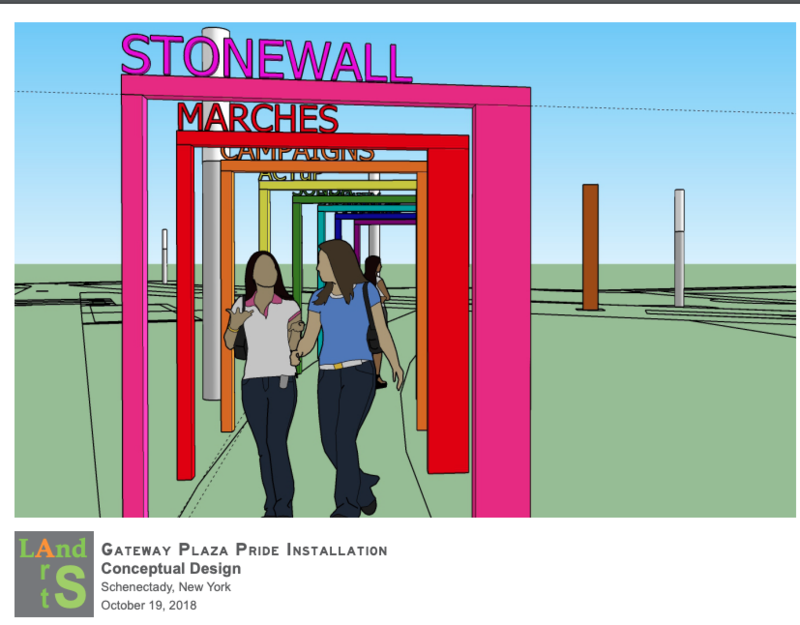 In my opinion, Schenectady PRIDE and the 50th Anniversary of the Stonewall Uprising deserve a much better design. This entry was posted in Preservation, The Snowmen Effect, Zoning/Planning and tagged ALCO Heritage Trail, Gateway Plaza, Mary Moore Wallinger, Mayor Gary McCarthy, Metroplex by David Giacalone. Bookmark the permalink.